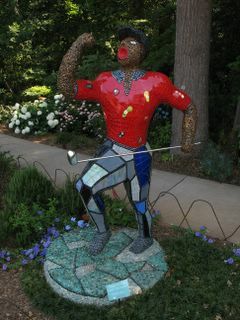 This is the French artist Niki de Saint Phalles' rendering of Tiger Woods. He, along with other very large figures, are included in the world's largest exhibition of sculptures with mirrors, glass, semi-precious stones and ceramic mosaics. The artist died from inhalation of polyester (the material used to shape her sculptures), and her work is on display at the Atlanta Botanical Garden through the Niki Charitable Art Foundation. Great posts. Will come back for more. Please take the time to visit my golfing blogs: Golf Instruction Guide, Golf Shoes Blog, Online Golf Lessons Guide. Thanks! No problem giving you a reciprocal link. Money talks. It's hard to blame them though. Imagine reaching 2-3 times as many potential customers and doubling your net income. That would be hard to turn down for anyone. Afterall, the one single point in owning a business is to maximize profit. Not disagreeing with you, but I can kind of understand the move.